Apply for Reporters Without Borders Berlin Scholarship 2019 Here for Free. Reporters Without Borders Berlin Scholarship 2019… Reporters Without Borders Germany invites journalists from war zones and crisis areas to come to Berlin for four months. During this time they can enjoy a break and complete a comprehensive training program in digital security issues relevant to their work. The program is funded by the Berlin Senate Department for Economics, Energy and Public Enterprises. The aim of the scholarship is to provide scholarship holders with practical knowledge on how to protect themselves against digital threats such as surveillance or hacker attacks in their journalistic work. In addition, they will also receive training in how to teach others in their home region about digital security issues. From May 1st, 2019 until December 31st, 2019, eight journalists from war zones and crisis areas will be invited to Berlin for a period of four months each (1.05.2019 to 31.08.2019 or 1.09.2019 to 31.12.2019). are interested in passing on the knowledge acquired during the scholarship program to colleagues in their home regions and, ideally, already have some experience in teaching (including in other areas). We cover the travel costs, take care of all visa-related matters, provide a pleasant apartment in Berlin for the duration of the scholarship, a monthly stipend of € 1000, free use of public transportation in Berlin, and also organize participation in a varied scholarship program taught by experts in the field of digital security. 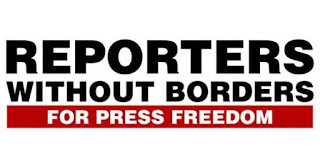 Furthermore, during their stay in Berlin, scholarship holders will be given insights into the activities of Reporters Without Borders, a globally-active journalist and human rights organization. Applicants must have a very strong command of the English language, as the scholarship program will be conducted entirely in English. A high level of proficiency in regards to digital security is not required; anyone who is used to working with a computer can apply. Applicants should also have adequate experience working as a journalist, be it as a professional journalist or a citizen journalist. In addition, applicants must have every intention of returning to their home region after four months of residence in Germany. Please send a completed and signed application form, the completed questionnaire, your CV and your identity documents in separate PDF documents as attachments (in total 4 PDF’s) either via: Signal-Messenger to +49163 6182705 or if you have an Protonmail-Account to rog.digitalfreedom@protonmail.com or if you know how to use PGP by encrypted email to digitalfreedom@reporter-ohne-grenzen.de (GnuPG/GPG-Key). The deadline for applications is Tuesday, February 19th 2019 at 23:59 (Central European Time). Please use the application form and the questionnaire provided by us to apply. We ask for your understanding that we can only contact applicants who are shortlisted for a place on the program.